Aretha Franklin in a bad hat? I going with earrings. I wish they would take him up 30,000 feet and drop him on Scotland without a parachute. Just make sure it is in a field. NOOOOO!!!! Others can read later!!!! Good night Monkeys! Sleep tight! If I don't go to bed, I'll look like this in the morning and be GAF! 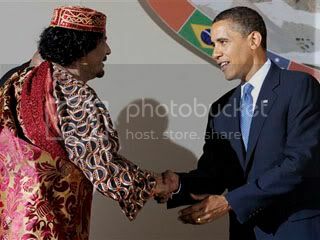 Glad to see our prez shaking hands with a person that bombed a plane over Scotland. SORRY MONKEYS, RANT IS OVER THIS JUST MAKES MY BLOOD BOIL. I guess I will be banned for this Rant. That one just sent me outside to howl at the moon!!! (I went behind the garages and down a few, so nobody will know it was me.) I turned all the lights off inside in case someone calls the police. It was one of those tonsils screams too. Sorry Fanny, I remember when ole Mohamar (sp) decided he would make nice with us before the second Gulf war. I could never be a politician, screw with me once fine, a second time, it's a push, the third time, you get the BUTTON. Dolce has been named "Jackass of the Month" over at Internet Forum Wars. I so hope she reads there. If not, I'm sure Steele will tell her. Saw this on Musings, thought ya'll might enjoy. I already look like that!!! What is GAF if I may ask? He does look like he is wearing some of Linda Baden's hand-me-downs. Fits me to a "tee!" I would like that so much Fanny. Pan Am Flight 103 had many US citizens on board coming home for Christmas. Just for all the young monkeys that don't remember Christmas time in 1988, here is an account from residents of Lockerbie Scotland. Found on Wikipedia, which I don't trust, but I believe this to be true. "A boy was lying at the bottom of the steps on to the road. A young laddie with brown socks and blue trousers on. Later that evening my son-in-law asked for a blanket to cover him. I didn't know he was dead. I gave him a lamb's wool travelling rug thinking I'd keep him warm. Two more girls were lying dead across the road, one of them bent over garden railings. It was just as though they were sleeping. The boy lay at the bottom of my stairs for days. Every time I came back to my house for clothes he was still there. 'My boy is still there,' I used to tell the waiting policeman. Eventually on Saturday I couldn't take it no more. 'You got to get my boy lifted,' I told the policeman. That night he was moved." Sorry for the history lecture, but if we don't learn from history it will repeat itself. Sorry for the rant I just want the younger crowd to know the history that isn't taught to them in school. Me too after my last rant Fanny. Good knowing you. I shall be banned to the netherworld after this one. Momar Kadafi No big red button recommendation from this Bee. That Kadafi is crazy as he77 and has U.S. blood all over his hands. Momar Kadafi No big red button from this bee. JSM - wasn't it a Canadian "South Asian" that bombed Scotland? We have a couple of them in jail here for it. But go ahead and drop Kadafi from 30,000 ft, the worthless piece of shite. Page created in 10.172 seconds with 19 queries.